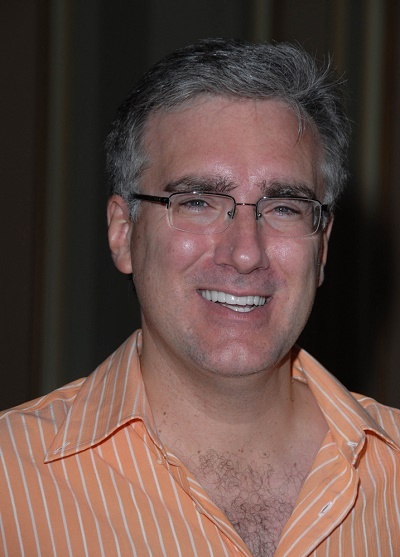 Keith Olbermann is an American television personality, commentator, and writer. He was the host of the shows Countdown with Keith Olbermann, from 2003 to 2011, and from 2011 to 2012, and Olbermann, from 2013 to 2015. Keith is the son of Marie Katherine (Charbonier) and Theodore Colin “Ted” Olbermann. His father was of approximately one half German, one quarter Polish, and one quarter Ukrainian, ancestry. His mother was also of approximately one half German ancestry, with her other roots being Dutch, Belgian, English, Irish, and French. Keith’s paternal grandfather was John Henry Olbermann, Sr. (the son of Henry Bernhardt Olbermann and Mary Ann Bridget Hammann/Hammanse). John was born in New York, and was of German descent. Keith’s great-grandfather Henry was the son of Frederick B. Olbermann and Katrina/Kate/Catharina Midelkamp. Mary Ann Bridget was the daughter of Joseph Hammann and Mary Gartnen. Keith’s paternal grandmother was Leonora Theresa Zielinski (the daughter of Antony Zielinski and Matrona Sawchenco/Safchenko). Leonora was born in New York. Antony was Polish, born in Krakow, Poland, to Antony/Martin Zielinski and Barbara Ryfnenska/Ryznenski/Ryjnenska. Matrona was born in Odessa, Russian Federation, and likely had Ukrainian ancestry. Keith’s maternal grandfather was Victor Henry Charbonnier (the son of Henry Charbonnier and Maria Eugenia Bauer/Schweitzer). Victor was born in New York. Keith’s great-grandfather Henry was born in Celle, Hanover, Germany, the son of Heinrich Fritz Charbonnier and Hilke. The surname Charbonnier is usually French, so Henry likely had French ancestry, to some degree, as well. Maria Eugenia was born in Utrecht, the Netherlands, the daughter of Gustave/Gustav F. W. Bauer, who was Dutch, and of Adelaide Johanne Katharine Stengel, who was Belgian. Keith’s maternal grandmother was Marie Ethel Schlumbohm (the daughter of Wilhelm John Schlumbohm and Eva Palmer). Marie was born in New York. Wilhelm was born in England, to German immigrants, Wilhelm J. Schlumbohm and Maria Dieckhauf. Eva was the daughter of Georges Wilkerson Palmer and Louise M. Worums, and had English, Irish, and possibly other, ancestry.